One of the top designers in the world and the leader in electric car technology were spotted engrossed in private conversation this past Sunday at an exclusive Academy Awards afterparty, amidst a flurry of rumors surrounding Apple's rumored plans to build its own electric, autonomous car. A source tells AppleInsider that both Jony Ive, Apple's famed designer, and Tesla CEO Elon Musk were among the attendees at Madonna's A-list Oscar afterparty on Sunday —an extremely exclusive event where all press and photography are strictly prohibited. Ive and Musk were observed speaking "really close" and "basically inseparable" from each other for a period that seemed to stretch on for roughly 30 minutes, this person said. The source said that Ive was walking around with a few people at the party before he was approached by Musk and their conversation began. The two were said to have exited the party together at around 5 a.m.
Of course, it's unknown exactly what the two icons may have shared with each other. But with recent reports suggesting Apple is working on some form of electric car —and Tesla serving as the current leader in electric car advancement —the alleged meeting and future interactions are sure to fuel the already rampant speculation on the matter. Given the tight security and no-press-allowed rules of the event, there are no photos of Ive and Musk in conversation. But both men, along with Steve Jobs's widow Laurene Powell, were spotted in attendance earlier in the day at the Vanity Fair Oscar party. Jony Ive and his wife Heather Pegg at the 2015 Vanity Fair Oscar afterparty. Madonna's Oscar party in Coldwater Canyon is commonly known in Hollywood circles as the afterparty of the popular Vanity Fair Oscar party, where both Ive and Musk were confirmed in attendance. Celebrities have been particularly drawn to the strict no press, no photographers policy of Madonna's gathering. This year's event was sponsored by Gucci, which provided attendees with an exclusive Gucci passport wallet as a party favor on their way out. 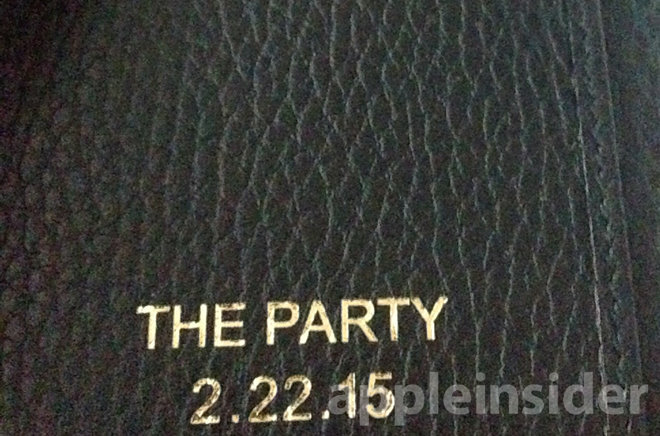 Gucci passport wallets were provided to guests of Madonna's exclusive Oscar afterparty. The meeting between Ive and Musk also comes after Musk himself revealed that Apple has been offering $250,000 bonuses and 60 percent raises in an effort to recruit some of his top Tesla engineers. According to Musk, while Apple has tried "very hard" to recruit Tesla employees, "very few people" have actually jumped ship. It was also reported a year ago that high ranking officials from Apple and Tesla have also met privately. Musk himself later confirmed the talks, but called a sale of his company to Apple "very unlikely." At the time it was suggested that the two companies could be collaborating on battery technology. In particular, Tesla is at work on a so-called "gigafactory" for the manufacturing of lithium-ion batteries —components crucial not only to Tesla's vehicles, but also to Apple's portable devices. Much has changed in the last year, however, and now it's believed that Apple and Tesla could find themselves at odds, if Apple is indeed working on a car inside its secret labs. One report from earlier this month quoted an unnamed insider as saying that Apple's project will go as far as to "change the landscape and give Tesla a run for its money."